The British army lieutenant and military historian William Siborne blamed many casualties during the Waterloo Campaign on William's inexperience, incompetence, desperation to save face, and grossly-inflated opinion of his own military abilities. In response, Siborne was accused by Lieutenant-General Willem Jan Knoop of many inaccuracies and contradictions. An inspection of the archives of Siborne by General Francois de Bas in 1897 confirmed the selective use of sources and "numerous miscounts and untruths". The defamation of the Prince of Orange and lack of recognition for his role during the Battle of Quatre Bras is attributed by some to efforts common to the 19th century to over-glorify and exaggerate Britain's military successes. 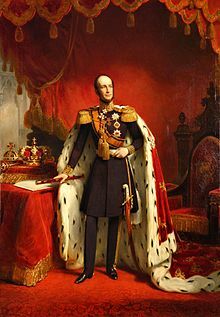 William Alexander Paul Frederick Louis (19 February 1817 – 23 November 1890), William III, King of the Netherlands (1849–1890). David Hendrik, Baron Chassé was a Dutch soldier who fought both for and against Napoleon. He commanded the Third Netherlands Division that intervened at a crucial moment in the Battle of Waterloo. In 1830 he bombarded the city of Antwerp as commander of Antwerp Citadel during the Belgian Revolution. Willem Jan Knoop was a Dutch lieutenant-general, military historian, and politician. 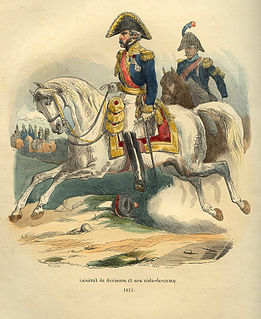 As a young captain of the Dutch General Staff he wrote a rebuttal of the English military historian captain William Siborne's account of the Battle of Quatre Bras and the Battle of Waterloo, published as History of the war in France and Flanders in 1815 in 1844, in which Siborne disparaged the conduct of the Dutch army at these battles. Siborne's book had caused a furore in the Netherlands as he saw fit to insult the honor of the Dutch army, and of king William II of the Netherlands, who as Prince of Orange had commanded that army at both battles, and was revered as a national hero by the Dutch. As Siborne's book is still in use as a source for Anglophone historiography of the battles, and is still the subject of controversy, Knoop's criticisms are still relevant, and play a role in this controversy. Willem Frederik count of Bylandt or Bijlandt was a Dutch lieutenant-general who as a major-general commanded a Belgian-Dutch infantry brigade at the Battle of Quatre Bras and the Battle of Waterloo. Hendrik George, Count de Perponcher Sedlnitsky was a Dutch general and diplomat. He commanded the 2nd Netherlands Division at the Battle of Quatre Bras and the Battle of Waterloo. William Siborne, Sibourne or Siborn was a British officer and military historian whose most notable work was a history of the Waterloo Campaign. Antonie Frederik Jan Floris Jacob Baron van Omphal was a Dutch lieutenant-general and extraordinary aide-de-camp to William III of the Netherlands. He was awarded a knighthood in the Military William Order among other honours. ↑ DBNL. "Nieuw Nederlandsch biografisch woordenboek. Deel 1 · dbnl". DBNL (in Dutch). Retrieved 2017-09-01. ↑ "Z.M. (koning Willem II) koning Willem Frederik George Lodewijk, koning der Nederlanden, groothertog van Luxemburg, hertog van Limburg, prins van Oranje-Nassau". www.parlement.com (in Dutch). Retrieved 2017-09-01. ↑ "Willem Frederik George Lodewijk (1792-1849)". www.scheveningen1813-2013.nl. Retrieved 2017-09-01. ↑ News, Gay. "Intense Male Friendships Made King Willem II Liable to Blackmail". www.gay-news.com. Retrieved 2017-09-01. ↑ Jeroen van, Zanten (2013). 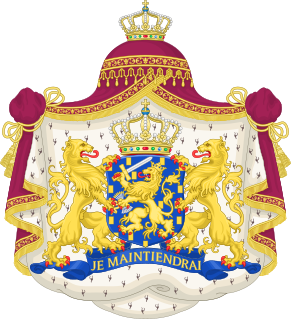 Koning Willem II : 1792-1849. dl. 2. Amsterdam: Boom. ISBN 9461051859. OCLC 864666575. ↑ "Willem II: intelligent, chantabel en in de knel". NRC (in Dutch). Retrieved 2017-09-01. ↑ "BOEKEN: Jeroen van Zanten, Koning Willem II (1792-1849)". Historisch Nieuwsblad (in Dutch). Retrieved 2017-09-01. ↑ Meeter, E. (1857). Holland: its institutions, its press, kings and prisons. ↑ Meeter, E. (1857). Holland: its institutions, its press, kings and prisons. p. 320. ↑ "No. 16494". The London Gazette . 11 June 1811. p. 1068. ↑ "No. 16533". The London Gazette . 22 October 1811. p. 2033. ↑ "No. 16642". The London Gazette . 8 September 1812. p. 1812. ↑ "No. 16824". The London Gazette . 14 December 1813. p. 2528. ↑ Andrew Bamford (2014). "The British Army in the Low Countries, 1813-1814" (PDF). The Napoleon Series. Retrieved 16 August 2015. ↑ "No. 16915". The London Gazette. 9 July 1814. p. 1393. ↑ "No. 16924". The London Gazette. 9 August 1814. p. 1609. ↑ "Willem II, Koning (1792-1849)". Het Koninklijk Huis (in Dutch). Retrieved 15 December 2014. ↑ "Geschiedenis van het Paleis Soestdijk". Paleis Soestdijk (in Dutch). Retrieved 16 June 2015. ↑ Historisch Nieuwsblad, June 2015: "Willem II en de Slag bij Waterloo - 1815 "
↑ "Koning Willem II gechanteerd wegens homoseksualiteit". ↑ Hermans, Dorine and Hooghiemstra, Daniela: Voor de troon wordt men niet ongestrafd geboren, ooggetuigen van de koningen van Nederland 1830–1890, ISBN 978-90-351-3114-9, 2007. 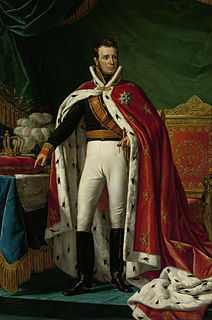 ↑ "9 December 1813 Het verheugd Rotterdam ontvangt Koning Willem I". Engelfriet.net. Retrieved 2014-05-14. ↑ "De Grondwet van 1814". Republikanisme.nl. Retrieved 2014-05-14.